Its smart colors stand out against a beige background covered with a blue palm leaf that evokes the Marquesan motifs. 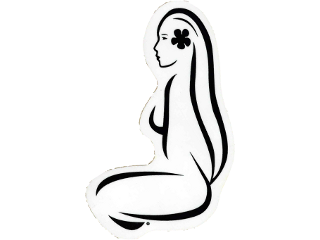 The outline black of a Hinano Vahine in profile appears on the side of the towel. Dressed in a sarong with beige flowers like a tiare flower she wears a traditional wreath in her hair. She is sitting cross-legged on a large leave of grey palm, indicating a lush and generous nature. In the background are drawn two coconut trees in grey. On the bottom of the towel, "Hinano Tahiti" is written in the same colors as the vahine, all in harmony.